Thanks so much to everyone who sent me photos to use in my PowerPoint presentation in my containers class. The class went well and I got some positive feedback, which I'm sure was based in large part on your photos! Things are in full bloom in my garden. Let's take a short walk. It's not so humid today, and I've made us lemonade. The sage makes a nice backdrop for the blanket flower, don't you think? We've had a lot of rain this spring and my various salvia got quite big. I love this combo with Jupiter's beard. I grew this baptisia from seed (don't you just love the rattly seed pods in fall?) and, after five years, it's really come into its own. 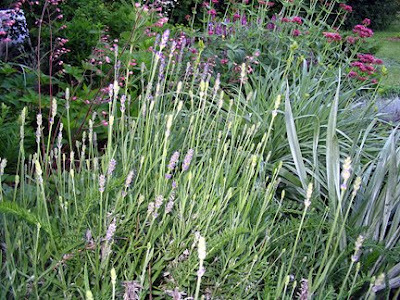 It's a little hard to see, but I love the pink coral bell flowers in the background of the lavender buds--they both sway in the breeze and look so elegant. I'm so excited that my yucca has finally (after two? three? 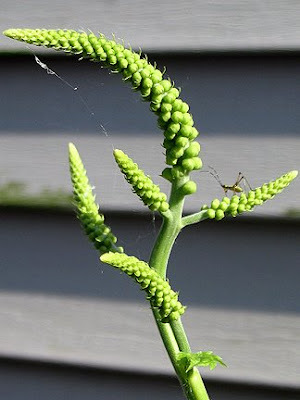 years) sent up a flower stalk! It's about five feet tall. And my oh-so-cute Diablo ninebark is flowering its heart out in the background. I got these (there's a twin out of sight) a few years ago in gallon containers for $3.33 at a Home Depot fall sale. They have really taken off! This spiderwort is next to my front door and I love seeing its friendly flowers as I leave for work. They close up in the sun. That's a purple sand cherry to its left and some Russian sage behind it, which blooms after the spiderwort has died back. To the left of the sand cherry is my groovy little prickly pear cactus. It has not flowered in the previous few years, so I can't quite tell if that new growth is in fact flower buds, or more cactus sections. Do you know? It kind of looks like a lobster, doesn't it? Mmmmmm... lobster. And look! Remember the groundhog eating my lettuce and kohlrabi? 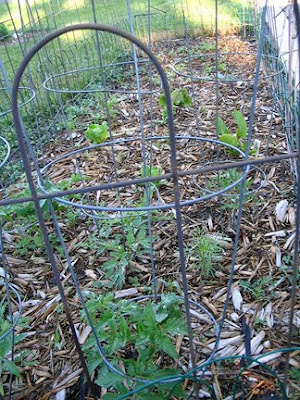 Most of the lettuces and one of the kohlrabis have grown back (though who knows for how long they'll remain intact!). There are also some cosmos and zinnia seedlings farther down. And the tomatoes look nice, too. Clearly, the groundhogs did not like their foliage, but my friend Amy tells me she has seen a groundhog shake her tomato cage, trying to get the fruit to fall. I swear all groundhogs have Ph.D.s! 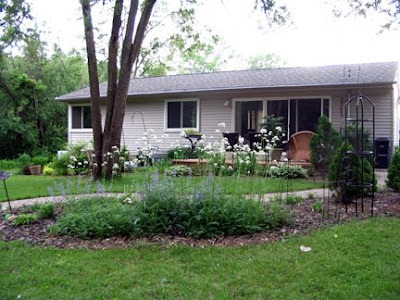 Moving into the little north-facing side garden, don't you just want to kiss this sweet painted fern? Um, hug? Erm, admire from a standing position at a respectful distance? 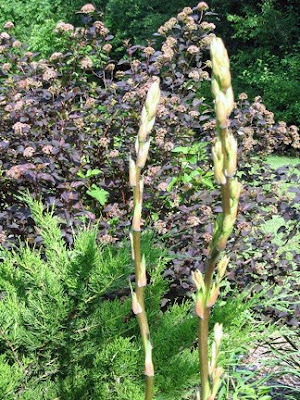 Aren't the buds of my black cohosh cool? The little visitor seems to think so, anyway. Can you see it? I knew you could! Moving into the backyard, that's my little cat garden with all kinds of catmints. 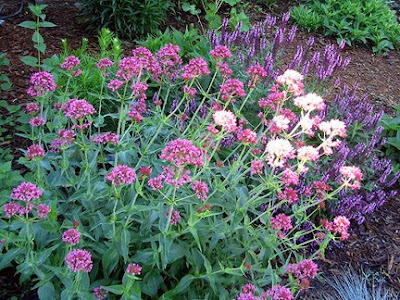 That's Walker's Low in bloom now (though it should be called Walkers Not-At-All-Low, but I can see marketing problems with that), as well as valerian (it's just as calming for cats as for people). Purrrrr! And, you're really in luck today because my time machine is back from the shop, so we can go back two weeks to the start of June. OK, get in. Yes, it's perfectly safe and well-tuned now. I'll just adjust the controls here... and there... and oopmh (that one always sticks) there. ZZZZZZoooomRattlesShakeFunkyLights. OK, we've arrived safely! Look, geraniums are still in bloom. 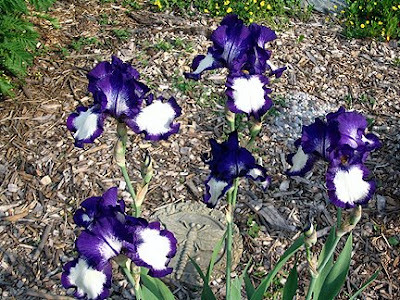 And so are the vibrant purple bearded iris, which I got from a gardening client and friend, Sara. 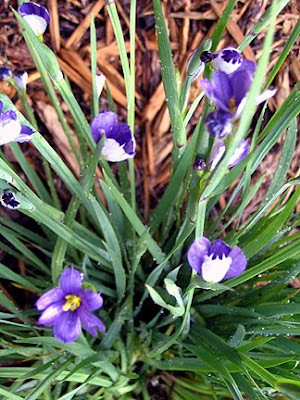 The blue-eyed grass is a little wilted but it's one of my favorite spring plants. Noogie! 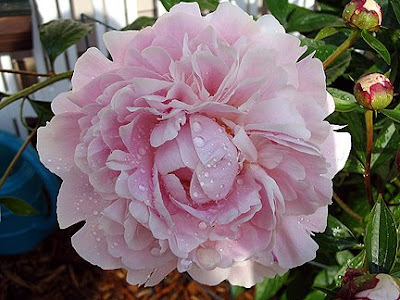 But the main reason we went back in time was to be able to see my peonies (also divisions from Sara) in bloom. They were absolutely gorgeous, don't you think?! Yep, I sure saved the best for last. But now it's time to return to June 14. OK, get in and hold on. No, not to me. OK, there you go. I'll just reset those knobs and switches (are you picturing the TARDIS circa 1978, too?) and here we go... RRRRrrrumbleShakeRattlePoofColors! We're back home. Thanks for joining me in my garden. And, in honor of Father's Day and Austrians everywhere, I really hope Austria can beat Germany in Monday's UEFA EURO 2008 game, or they are out of the championship. My mom is German and a huge soccer fan, so it's a tough call. But my dad, who passed away in 1997 at age 59, was Austrian, loved all things Austrian, and loved soccer. And besides, I always root for the underdog, so, go Austria! Wien, Wien, kennst mich up kennst mich down, nur Du allein. What a great walk through your gardens and yes even the ride in the time machine. I love the lushness of your flowers. I especially liked the nine bark-what a bargain and the cohosh. Can't wait to see it bloom. 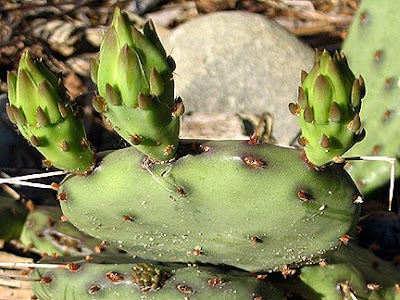 The cactus does look like it is budding, but time will tell I guess. Glad your class went well. Da bist du ja patriotischer als ich:) Fussball hat mich noch nie interessiert und daher stoert es mich auch nicht, wenn nicht viel darueber hier berichtet wird. Die Blanketflower vor dem Salbei ist wirklich schoen. Ich habe die zwei auch in die gleiche Ecke gesetzt, aber zu weit voneinander entfernt, um dieses Farbbild zu bekommen. Ich habe letzten Spaetsommer 2 Yucca gesetzt. Einer hat 1 Bluetenstab bekommen und hat diese Woche zu bluehen begonnen. Der andere nicht. Beruhigend zu wissen, dass es unter Umstaenden mehrere Jahre dafuer dauern kann. Bek, I haven't been watching the games because they're broadcast when I'm at work and on a channel I don't get! But my mom updates me on all the scores. I'm hoping to catch some of the 2:45 game online today. I don't mind a trip in the Tardis, as long as I don't have to deal with K-9. 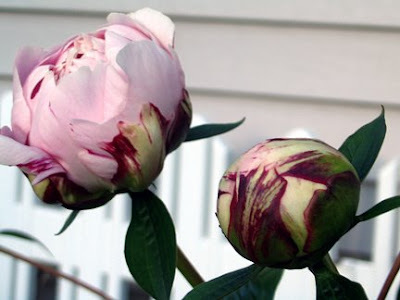 It was worth it, though, because your Peonies were so pretty. I was looking forward to my 1st Baptisia seedpods, but the deer came & ate them all off. Your Cohosh/Bugbane is way ahead of mine, the buds of which are just starting to droop. Thank you for your visit and comment.. So much in bloom! I chuckled, though, when I saw your yucca plant. I pictured something similar on an earlier post that I had seen in a test garden. It was labelled "Adam's Needle," and I thought it was very strange. Maybe I should have read the whole tag--it will probably bloom later,too. MMD, Glad someone else knows what the TARDIS is! I can't remember what I ate for breakfast yesterday, but I remember "Time And Relative Dimension in Space" from when I was 12. Eh yep. I'm happy to send you Baptisia seeds in the fall if you email your addy. Guild-Rez, meine Mutter heiist auch Gisela! Deine Seite ueber Shopping Carts ist ganz toll. Ich wusste nicht, dass die in Toronto so vernachlaessigt sind! Rose, I love "strange" plants like yucca and others whose flowers don't seem to match their foliage. I think I have tortured a lot of German garden bloggers with my insistance in commenting in German in their blogs, even though the only person I speak it with any more is my mom. It's nice to find the German words for plants, and see similarities--or differences in common names. For example, foxglove is Fingerhut (finger hat), which makes a lot more sense than a fox's glove. Yep, I'm a word geek! Hi Monica. Thanks for visiting my Colorado blog. I have left a reply to your comment. I can see that your taste in plants is a lot like mine. I'm adding you to my bloglist and will visit again. Have a nice trip!! bei dir blüht es ja auch wunderschön, dein Garten sieht toll aus. Schön das sich dein Gemüse von dem Groundhog wieder erholt hat, vielleicht kannst du ja doch noch was ernten. Du fragst nach der Schale bei mir im Garten. Ich schick dir ein Email mit Bildern. Hi Monica, thanks for the tour, lemonade and time trip. I don't remember TARDIS, too old probably, was it from a tv show? 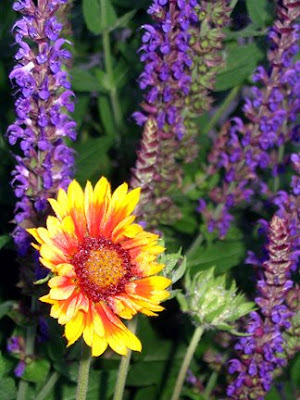 I love the salvia and gaillardia combo, we use gaillardia all over, it self seeds so prolifically, and blooms for such a long period. Your baptisia is wonderful, I grew some from saved seeds and they turned out to be white, I was sure the plant was blue that the seeds were picked from, oh well. We are big soccer fans here also, it was a jolt to read you talking about UEFA cup, kind of rare where we live in Tennessee! Glad your team won. I enjoyed visiting your garden. You have so many plants I love but don't have. I'm trying to find a place for baptisia. Everyone seems to agree it's a wonderful, carefree plant. 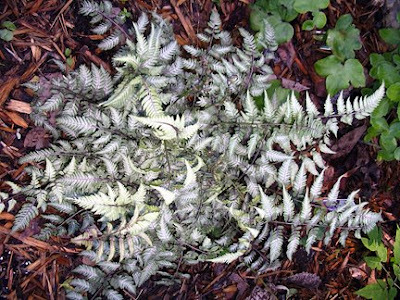 Your painted fern is beautiful. I'm jealous....I have a few little plants on the landing...no garden. Enjoy it! thanks for your comments....I agree...it's easy to get centred on yourself and your babies, but the future of the world even so! it's important too! 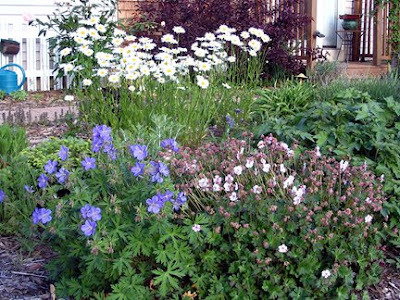 Sabine, Thank you for the photo you sent and for this cool link to a site for German-English translation of plant names! Handy! Nutzbar! Frances, the TARDIS is a time travel machine from the long-running British sci-fi show, Doctor Who. I wouldn't have expected most Americans to know that. Re-runs were broadcast on a Canadian channel, which we got over the air, when I was in my early teens. And in soccer, my team (Austria) actually lost, but Germany (sort of also my team) won! Roses and Lilacs, it's funny because earlier this season, I thought my painted fern was done for, but it really came to life! I'm happy to send you some Baptisia seeds later this season, if you like (though they do take long to grow). Screamish, Thanks for the compliment! My garden is actually quite weedy with clovers the size of small dogs. No matter how many times I pull them out, they creep back in. And, wait a second, aren't you in France?! It's ME who's jealous!! ~ Monica, eagerly awaiting her trip to Colorado!! Such a long and funfilled post, where to begin? Let's start with that painted fern; I would kiss that one and am not afraid to admit it! ;-) Must look for one too as it would look stunning in my new border. Your baptisia looks great and so do all the other blooms. Great news on your Yucca! 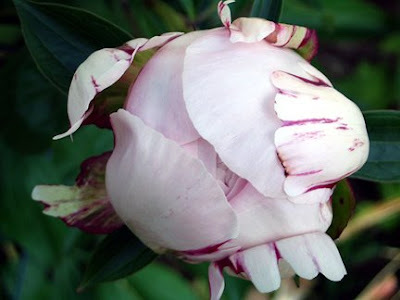 Loved the trip in the Tardis (Yup big dr Who fan here, the new one that is)and that Peony was absolutely gorgeous. Leider ist ja Dein Fußball-Wunsch nicht in Erfüllung gegangen. Aber Germany hätte ja einen Psychater gebraucht, wenn es gegen Austria hinausgefallen wäre. Aber dafür ist Dein Garten wunder- wunderschön, so vielfältig und abwechslungsreich mit den Blumen. Diesen Spaziergang mache ich doch gleich noch einmal!!! Deinen Farn habe ich übrigens auch, nach dem Pfauenradfarn ist er mein zweiter Lieblingsfarn. Oh what a beautiful walk through your lovely garden! 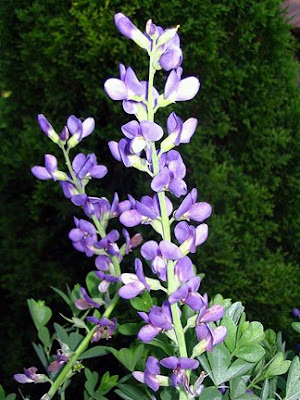 I've never grown baptisia, but I would like to,~looks like a beautiful plant, I I've seen it in the most gorgeous blue shade's~exactly what I need for my blue & white bed!! And I love a plant with interesting seed head's! 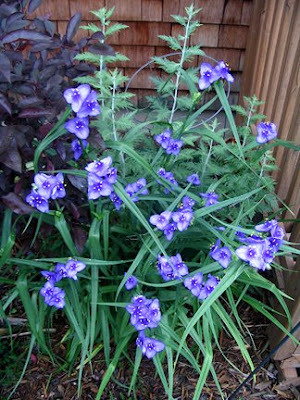 also love the spiderwort ~another plant I must try!! Thanks for the beautiful tour of your garden! Nice selection of flowers you have there!